We recently stopped here for dinner and had a lovely experience. The staff is friendly, engaged and focused on your comfort. The tables are spaced generously and provide plenty of room for comfort and privacy. There is also plenty of parking! We started at the bar as we waited for our table and it was comfortable enough we could have stayed there for dinner! We chose the house specialty, the Mango Jalapeno Margarita. This was an excellent start to what turned out to be one of our favorite meals in a very long time! The Margarita featured patron silver tequila, Cointreau, jalapeno simple syrup, fresh lime and a very special spicy smoked sea salt on the rim! The short wait was over and we were seated at a spacious table in the rear of the restaurant. The quiet space seemed to bring out even more flavors of the food as we started the meal. Of course we had to start with the Blue Point Oysters that came with mignonette and cocktail sauce. They were chilled and displayed perfectly and each one was delicious! A unique house favorite, Smoked Lamb Brisket, followed. The brisket was firm, tender, and crispy on the outside and not at all gamey. It was served with peanuts, corn chowchow and bourbon soy glaze. 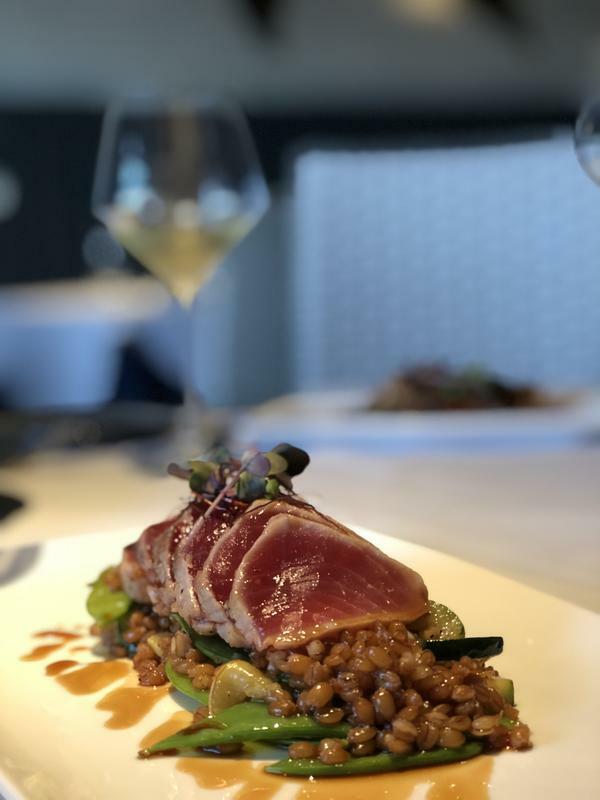 The seared Hawaiian Tuna was very fresh, cooked perfectly and the farro was the perfect compliment in both flavor and texture. The snap peas, zucchini, yellow squash and citrus soy sauce added to the goodness. The Tuna was seared evenly around the outside of the filet and it made a very elegant presentation. The Gulf of Maine salmon was cooked medium and was very tender with only light seasoning. The Corn Chowder and sweet potatoes brought this dish together perfectly and added delicious flavor to an already incredible plate of food. The Lobster Crusted Day Boat Cod was yet another in a long line of excellent preparations. This is a very unique way to prepare the Cod and I enjoyed it to the last bite. The addition of Klondike Rose potatoes, sautéed spinach and lobster veloute made this plate a flawless meal! Another House favorite, The Maine Event, is another sure bet. 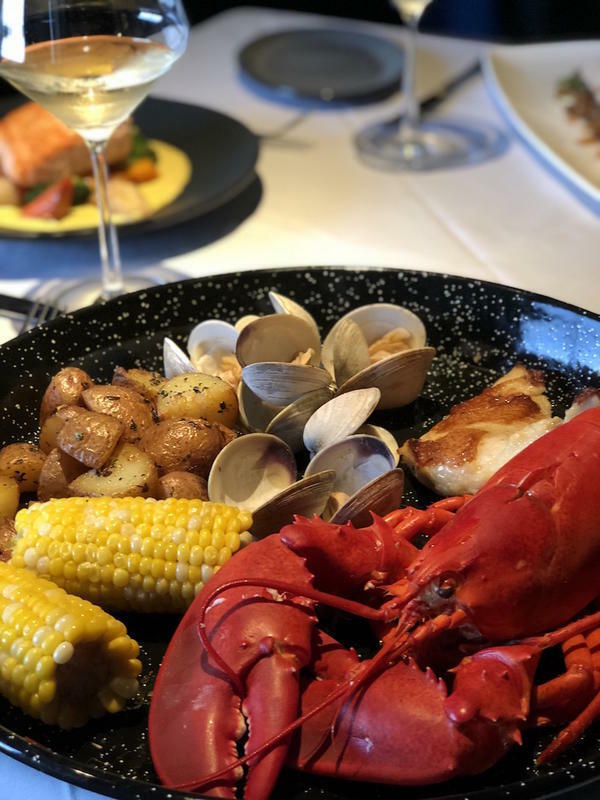 This New England Style Lobster Bake comes with a whole Maine lobster, roasted chicken, steamed clams, red skin potatoes and sweet corn on the cob. This is a big meal and covers a lot of ground but if you’re in the mood, this is a package that delivers on every level. We split the Jar of Key Lime Pie for dessert. This was really something! The presentation was certainly new and the wild Maine blueberry compote with crumbled graham cracker was the prefect combination and came across light and deeply full of flavor. After the meal, I asked Chef Anthony, about his inspiration as several of the dishes on the menu are his own unique creations. For example, he added the farro to the Hawaiian Tuna to deliver something unexpected that most guests were probably not accustomed to and then making them love it immediately upon introduction. Chef Anthony takes great care to add unique flavors to common seafood dishes. The menu here does change seasonally. 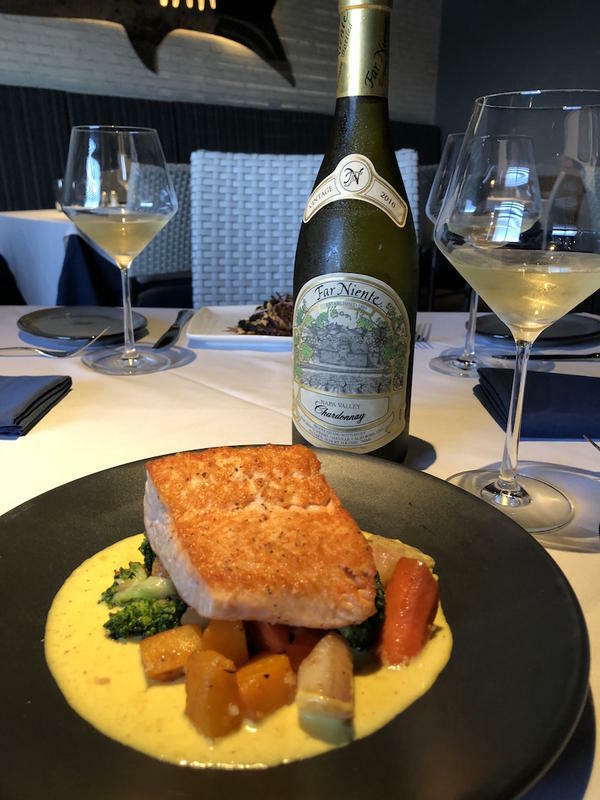 Chef Anthony wanted to highlight the fall season and also include references to his mentor, Marc Standen, the head chef of downtown’s Blue Point Grille. Marc served as a great inspiration to Anthony during the time he worked there. Chef Anthony has great things in store for those who frequent Kingfish. If you haven’t been yet…now is the time to introduce yourself! You’ll be hooked at first bite (pun intended) and quickly become a regular. Take a Cruise Around Cleveland!